Most commercial tandem cranksets are very similar, and rather expensive. Building up your own crankset gives you a fine opportunity to try different ideas and save money. If you know how to assemble and rebuild bicycle components, a tandem crankset isn't hard to build. In fact, you can assemble a fine tandem crankset from solo-bike parts. You can even build a tandem crankset from the leavings in bike shop spare parts bins. Parts for common cranksets are compatible across many brands and models. On a tandem, cranksets with relatively large chainwheels are preferable to the newer mountain bike cranksets with tiny chainwheels. The smaller the chainwheel and the slower the chain moves, the higher its tension and the more rapid the wear to chain, chainwheels, sprockets and bearings. 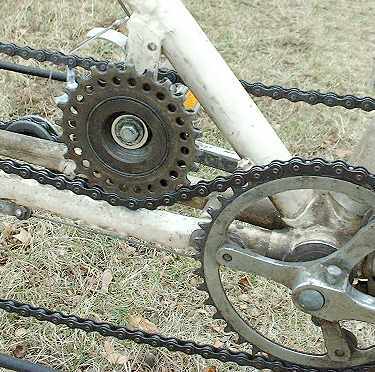 To the degree possible, use large rear sprockets, not a tiny chainwheel, to get low gears on a tandem. Let's look first at the simplest way to assemble a tandem crankset: single-side drive. This is illustrated below, looking down from the top of the tandem. The front crankset is to the right in the picture, and the freewheel is to the left. Both chains are on the right side of the tandem: the primary chain from the rear crankset to the rear wheel, and the synchronizing chain which connects the two cranksets. Single-side drive requires no special tandem parts. You use two ordinary solo-bike cranksets. Because the chain tension from the front crankset is transferred along the right side of the tandem through both chains, stresses on the bottom brackets and cranks are no higher than in solo bike use. You can use almost any cranksets, except the cheapest ones with the spider riveted onto the right crank. A single-side system is light, too: only two (instead of three) of the tandem's four cranks have spiders, and the bottom bracket spindles can be shorter on the left side. It is usual to place the synchronizing chainwheel to the inside of a single primary chainwheel. That way, the right front crank is closer to the centerline of the bicycle, improving cornering clearance. With two primary chainwheels, the synchronizing chainwheel can be either on the inside or the outside, but it must be smaller than the nearer primary chainwheel. It may have to be very small if on the inside, increasing stress and wear. A triple crankset can allow the synchronizing chainwheel to be on the outside, where it need only be slightly smaller than the outer drive chainwheel -- with somewhat reduced cornering clearance. But what if you would like to use triple primary chainwheels? It can be done! Modern wide-range front derailers require 10mm or more of clearance between the largest primary chainwheel and the right crank. And the smallest chainwheel has its own, separate set of attachment bolts. For these reasons, most modern triple cranksets let you install a fourth chainwheel at the outside. Common cranksets, like the one shown in the photograph below, use 110 mm and 74 mm bolt circle diameters. Use a racing triple chainwheel bolt set (a special-order item from most bike shops) to secure the synchronizing chainwheel to the spider along with the outer and middle primary chainwheels. The long sleeve nuts of the bolt set should mount from the inside, to secure the heavily-stressed primary chainwheels. For chain clearance, add a set of thin washers to space the synchronizing chainwheel a bit extra far from the primary chainwheel. outermost (synchronizing) and second (outer primary) chainwheels. To clear the front derailer, your outboard synchronizing chainwheel should be smaller than the largest primary chainwheel. Don't use a synchronizing chainwheel of much less than 40 teeth, though, or it will wear quickly and is more likely to interfere with the crank. As the photo shows, the crank spider does not directly support the synchronizing chainwheel if you are using four chainwheels. Use a chainwheel with recessed bolt holes, as shown, so the bolts will position the chainwheel accurately and hold it securely. You may have to remove dropped-chain-catching pegs from chainwheels and/or the right crank, but you won't miss them: the synchronizing chain takes their place. So the synchronizing chain runs straight, preferably also place the single front chainwheel as far outboard as possible without the chain's interfering with the crank, so you can use a shorter bottom-bracket spindle. If you are using the same type of crankset at the front and four chainwheels at the rear, both bottom-bracket spindles will be the same. You might use a longer bottom bracket spindle instead, but this will reduce cornering clearance. Thanks to Stu Giesecke for the photo of his tandem with single-side drive, synchronizing chainwheel on the outside. Says he: "I have ridden a same-side setup like this for thousands of miles. thanks, SB." A do-it-yourself crossover drive system is more difficult to build than a single-side system. You must use a three-piece crankset for the primary crankset, so it can have chainwheels on both sides. Square-taper or ISIS cotterless cranks and bottom brackets are suitable and widely available. To build a crossover drive system with cranks made for solo bikes, you have to put right cranks on the left side of the bicycle, and a left crank on the right. 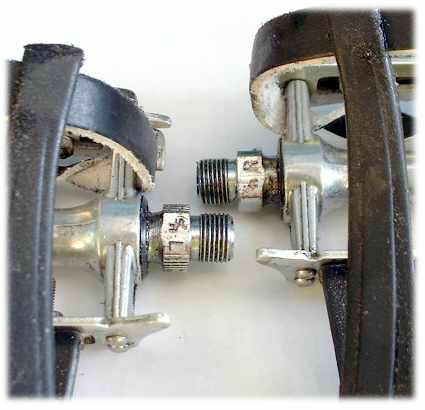 Left bicycle pedals are left-threaded so pedaling forces tighten rather than unscrew them. For this reason, three of the four cranks in a tandem crossover crankset are special. Two left-threaded cranks have chainwheels, and one right-threaded crank has none. You will need three right cranks and one left crank. 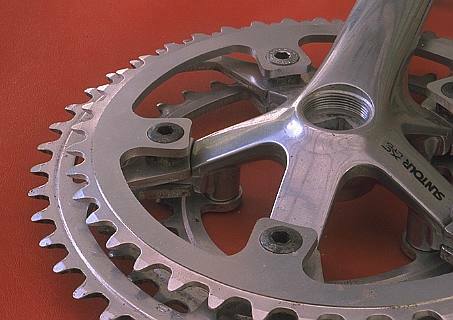 Only a three-piece crankset (square-taper or ISIS) will work as the primary crankset, as the bottom bracket must be able to accept a crank with a chainwheel on both sides. A crossover system stresses the cranks heavily. Most good mountain-bike cranks, and many others, will work. Don't use cottered cranks on the primary crankset with crossover drive. You will need three right pedals and two left pedals. If you can find left and right pedals identical except for the threading (usually, double-sided pedals), you will need only one left pedal. Pedals made for toeclips and straps are common in bike shop spare-parts bins, as many people have traded these in for locking shoe-pedal systems. 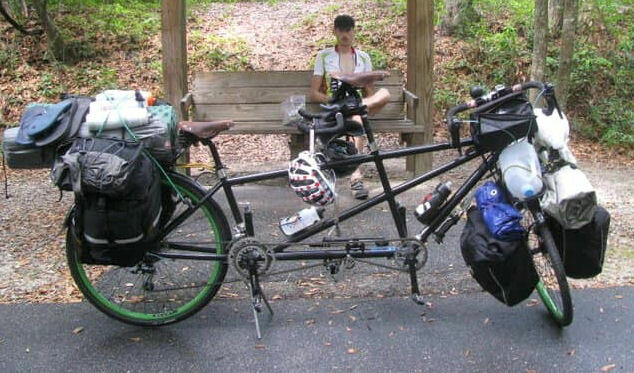 Toeclips and straps work well on a tandem, because you can bungee the pedals together to keep them upright.. If the left and right pedal shells are different, you will need to rebuild two left pedal shells with right-threaded pedal spindles and one right pedal shell with a left-threaded pedal spindle. Secure the reverse-threaded pedals to the cranks with removable thread-locking compound such as blue Loctite™. This is available at auto parts stores and hardware stores. If you use steel cotterless cranks (sometimes found on older Fuji bikes...) and a long pedal wrench such as the Park pedal wrench, you can get away without using thread-locking compound, as long as you tighten the reverse-threaded pedals extra-well. Some people, including a high-end tandem builder which will remain nameless here, have converted crank threading using Helicoil™ threaded inserts -- but the necessary enlarging of the pedal hole does weaken the crank somewhat, and if you are going to all that trouble, you might as well just buy a ready-made tandem crankset. A pair of Wrong Bros. pedals -- right spindle in left pedal, left spindle in right pedal. Aligning the chainwheels is easiest if both cranks and bottom-bracket axles are of the same make and model. If you don't, then be prepared to experiment with bottom bracket axles and chainwheel spacers. Take extra care that the two left cranks are aligned so the synchronizing chain will run straight. Remember, you will need at least one bottom bracket axle with ample length on both ends for the primary crankset, which has chainwheels on both sides. Many mountain-bike axles are long enough. Use high-grade (racing quality) bottom bracket parts, especially in the primary crankset. Its bottom bracket must withstand twice the usual stress. If using cup-and-cone bottom brackets, use 11 loose bearing balls in each side rather than bearing retainers, most of which have only 7 or 8 balls. Check and recheck the crankbolts and bottom brackets in your first few days of riding with the new crankset. Why go to all the trouble to build a crossover system, when single-side drive is so much simpler? There are good reasons. You can use any chainwheel-sprocket combination without chain-angle problems, since the long front chain reduces the angles. The primary chain lasts longer, because the wear is spread among more links, and so the sprockets also last longer. Both riders can see and hear the front derailer. Stresses on the bottom brackets and the frame are lower than with rear crossover drive. You can switch easily and quickly from the conventional rear crankset to a kidback by using a chain that runs diagonally from the kidback down to the front crankset, and lashing the conventional rear crankset to the frame so it does not turn. You do not have to remove the rear pedals when switching to the kidback. If you are building your own tandem frame and using an idler to adjust the synchronizing chain, the idler should be in the slack run of the chain to minimize drag. With front drive, the idler is then up inside the frame where it is well-supported and unlikely to be damaged. The idler shown is an old freewheel, with the pawls removed, bolted to a slotted steel bar. Both sides of the bike have chains, making it more difficult to lift the bike without getting chain dirt on yourself. The long primary chain may soil the rear seat tube. There's more chain, and so the bike weighs a little more (but probably, this is less important than the increase in drive efficiency due to smaller chain angles). You have to make sure that the primary chain clears the right rear crank. Generally, it will if the rear bottom bracket axle is as long as the front one. If you ride over big bumps, the long primary chain can flop around. Front drive doesn't make much sense for off-road riding. Even on a road tandem, it's a good idea to put a chain idler just ahead of the rear bottom bracket to control the long, slack lower run of the primary chain. But the need for an idler can become an advantage: a sprung, two-pulley idler made from a rear derailer chain cage takes up chain, increasing derailer capacity, and improves shifting. Cornering clearance is reduced for the right front pedal. Whether this is a problem depends on the tandem's bottom-bracket height, crank length and pedal width. I'll finish with another advantage: because all the gears are usable, front drive is ideal for half-step gearing -- but that is a subject for another article.